A trip to Stockholm Ström with Ed and Rob for Seatrout, again the tempature gauge was in the minus range. We legered prawns to start with, before I tried a maggot bait on a size 14 hook and quickly had a bite. 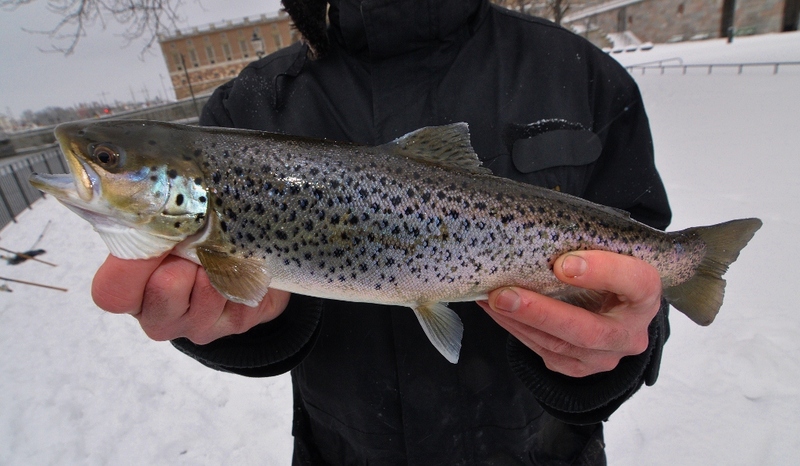 A lovely fight ensued and I was delighted when a fine Seatrout broke the surface! After that we all had maggots on the hooks. An hour later I had a second fish, not quite as large as the first. though it was long, it was not as deep as the first. Ed was unfortunate to miss a couple of bites after that, before we called it a dat as the cold begsan to bite..
A couple of days later I returned with Andy Shaw, though we didn't land any fish on the day. In almost five hours we had two bites apiece and missed them all! 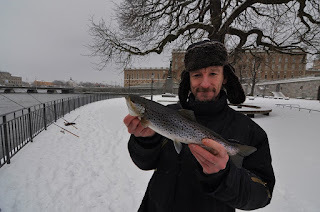 Andy had a quite remarkable bite, a violent take which lurch the rod over and almost pulled it over the railing, before it bounced back and onto the ground. It seems pereseverence here might pay off with a good fish, they grow big here and the record is far in excess of 30lb.! 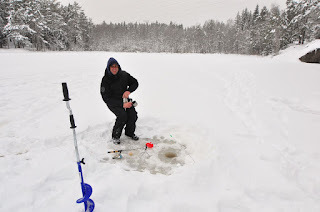 A few shots here of a day out ice fishing at Sandasjön in Nacka. 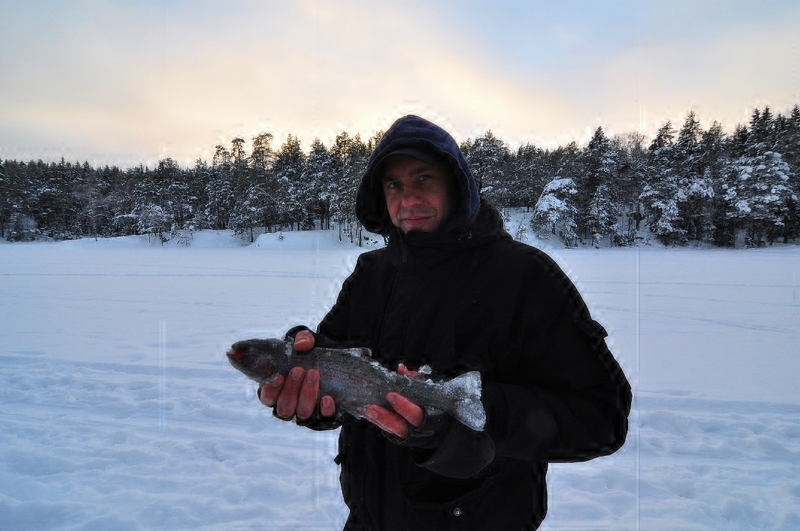 An early Febuary trip that was not for the faint hearted as the tempature was a wicked -14 degrees! Despite this Andy Shaw and I travelled out to fish and we had plenty of bites, which were tentative at first, though later the fish seemed to come on the feed and we had several positively ripping bites. I lost what must of been a very good fish, which straightened my hook out after a few minutes, this was a very powerful fish that made several runs before coming off. Andy then lost a good fish and missed a few bites before eventually landing a lovely trout, somewhere over the pound mark. 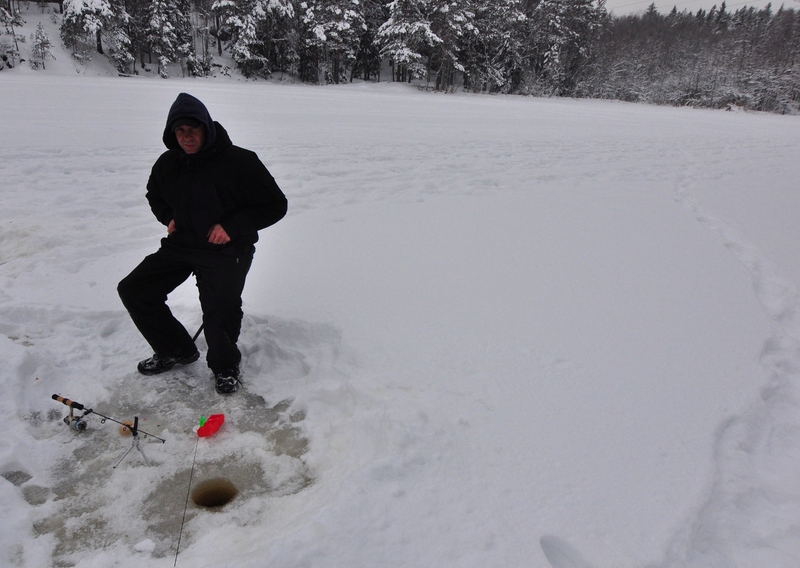 A good day out and nice to wet a line during the winter months..